Sometimes after cutting a fruit, veggie or bread I get an inspiration for a particular lunch. On this occasion I thought I'd just pack some lasagna into Nikolai's Lunchbots insulated thermal and add some sides and call it good enough. After the bread was cut, a few slices looked like a puppy to me and I decided to add candy eyes and raisin nose for the features. I also added some bone shaped cheddar on his lasagna. Have you experience a similar situation? He also had seedless black grapes with a dog pick and crinkle cut cucumber slices as sides in his Lock & Lock container. Here is a simple leftover pizza for lunch. I added a thin slice of smoked Gouda cheese on the top of the pizza, give me five! His sides were babybel cheese, pretzel snaps, baby carrots and red grapes. 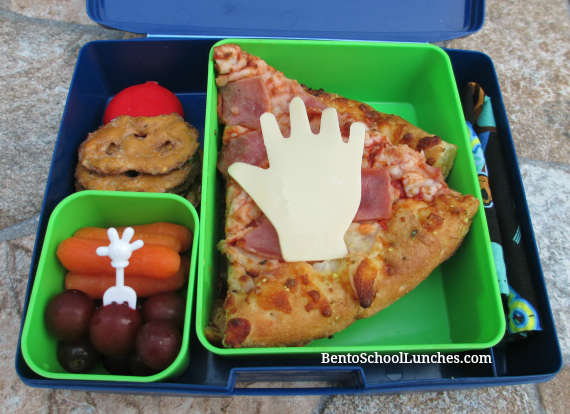 This lunch was packed in his Laptop Lunches. Your leftovers look so good, I'm so hungry now at bedtime, lol. Love the little puppy! So cute! 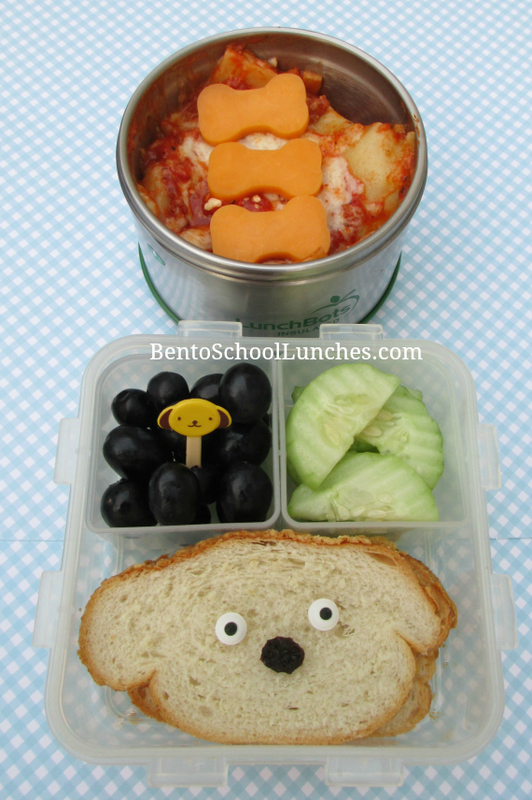 These lunches look yummy. Love the way you used the bread to inspire your dog theme.